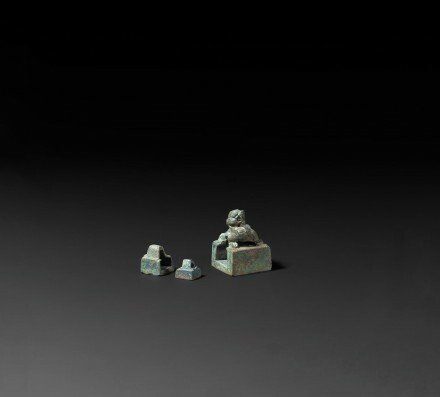 with two small plain seals nested together and fitted into a recess at one side of the principal seal, beneath the chimera knop, the surface lightly encrusted with mottled green patination from burial. 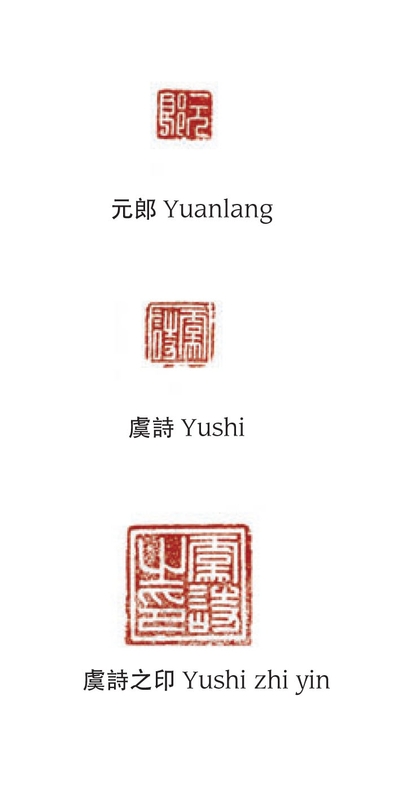 The principal seal shows the owner’s given name “Yushi” followed by “his seal”; the second seal repeats the given name “Yushi”; the third seal shows “Yuanlang”, a courtesy name (zi), traditionally taken by literati at the age of 20 as the name to be used by other adults of his same generation on formal occasions, or in writing. Compare a very similar bronze three-piece seal discovered in an Eastern Han tomb at Xi Taiping village, Linzhang county, Hebei province and now in the Linzhang Cultural Relics Institute, illustrated in Zhongguo wenwu jinghua dacidian: jin yin yu shi juan (Dictionary of Chinese Cultural Relics: Gold, Silver, Jade and Stone), Shanghai, 1996, p. 421, no. 041.